bob, originally uploaded by designsponge. 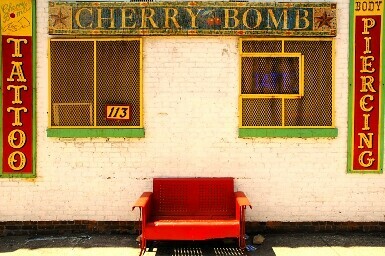 This photo of the Cherry Bomb tattoo and piercing shop in Greenpoint was selected by design*sponge as the second place winner in its Bklyn Designs photo contest. Cool round rolling stool from Small Factory Design to come. Thanks to Grace Bonney for picking this photo, which is really not a lot more than a capture of the streetscape slightly post-processed to notch up the colors.